Simultaneously, although patients are at year-round risk for parasitic infestations (see “Cold Weather Flea & Tick Control”), compliance declines during cool or cold seasons, as pet owners are less likely to see the need for preventives when they perceive parasites to be scarce.3 This so-called “off-season” can be an opportunity to reinvest the team’s time into the health of patients and the practice to improve patient welfare and practice financial success. When the practice performs well financially, there are resources available to invest in supporting team members and helping patients. An increased investment in team support can enhance team member buy-in, thus further promoting client education, patient welfare, and the economic health of the practice. Optimizing compliance is not only financially favorable to the practice but also beneficial to patient health and client loyalty. As higher compliance has been directly linked to decreased dosing frequency and ease of administration, recommending a more convenient medication has high potential for ensuring successful parasite prevention. 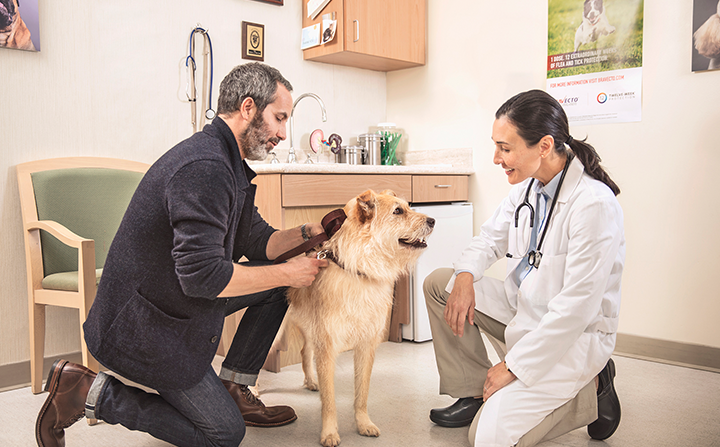 In this season of decreased parasite control compliance, now is the perfect time to be proactive about preventive care. ‡BRAVECTO® kills fleas and prevents flea infestations. BRAVECTO® Chew and BRAVECTO® Topical for Dogs kills ticks (black-legged tick, American dog tick, and brown dog tick) for 12 weeks and also kills lone star ticks for 8 weeks. BRAVECTO® Topical for Cats kills ticks (black-legged tick) for 12 weeks and American dog ticks for 8 weeks. IMPORTANT SAFETY INFORMATION: BRAVECTO has not been shown to be effective for 12-weeks’ duration in puppies or kittens less than 6 months of age. BRAVECTO Chew: The most common adverse reactions recorded in clinical trials were vomiting, decreased appetite, diarrhea, lethargy, polydipsia, and flatulence. BRAVECTO is not effective against lone star ticks beyond 8 weeks of dosing. BRAVECTO Topical Solution for Dogs: The most common adverse reactions recorded in clinical trials were vomiting, hair loss, diarrhea, lethargy, decreased appetite, and moist dermatitis/rash. BRAVECTO is not effective against lone star ticks beyond 8 weeks of dosing. For topical use only. Avoid oral ingestion. Use caution in dogs with a history of seizures. Seizures have been reported in dogs receiving fluralaner, even in dogs without a history of seizures. BRAVECTO Topical Solution for Cats: The most common adverse reactions recorded in clinical trials were vomiting, itching, diarrhea, hair loss, decreased appetite, lethargy, and scabs/ulcerated lesions. BRAVECTO is not effective against American dog ticks beyond 8 weeks of dosing. For topical use only. Avoid oral ingestion. The safety of BRAVECTO has not been established in breeding, pregnant and lactating cats. Use with caution in cats with a history of neurologic abnormalities. Neurologic abnormalities have been reported in cats receiving BRAVECTO, even in cats without a history of neurologic abnormalities. Barker S, Knippenberg R. When veterinary clients spend the most—and the least. DVM360 Magazine. http://veterinarynews.dvm360.com/when-veterinary-clients-spend-most-and-least?pageID=1. Published July 18, 2016. Accessed August 16, 2018. Larkin M. Practices busier than ever, except for one time of year. JAVMANews. https://www.avma.org/News/JAVMANews/Pages/170315c.aspx. Published March 15, 2017. Accessed August 16, 2018. Gates MC, Nolan TJ. Factors influencing heartworm, flea, and tick preventative use in patients presenting to a veterinary teaching hospital. Prev Vet Med. 2010;93(2-3):193-200. Lavan RP, Tunceli K, Zhang D, Normile D, Armstrong R. Assessment of dog owner adherence to veterinarians’ flea and tick prevention recommendations in the United States using a cross-sectional survey. Parasit Vectors. 2017;10:284. Van Vlaenderen I, Nautrup BP, Gasper SM. Estimation of the clinical and economic consequences of non-compliance with antimicrobial treatment of canine skin infections. Prev Vet Med. 2011;99(2-4):201-210. Claxton AJ, Cramer J, Pierce C. A systematic review of the associations between dose regimens and medication compliance. Clin Ther. 2001;23(8):1296-1310. Cavanaugh M. AAHA state of the veterinary profession. American Animal Hospital Association. https://www.aaha.org/public_documents/professional/resources/aaha_state_of_the_industry_2013_white_paper.pdf. Published October 2013. Accessed August 16, 2018. The Path to High Quality Care: Practical Tips for Improving Compliance. Lakewood, CO: American Animal Hospital Association; 2003.